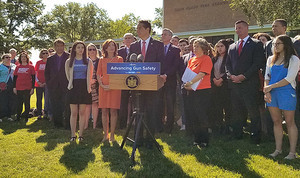 Governor Andrew M. Cuomo visited Westchester County as part of the statewide campaign to pass the Red Flag Gun Protection Bill. The Red Flag Protection Bill, also known as the Extreme Risk Protection Order (ERPO) Bill was advanced by the Governor last week. Westchester District Attorney Anthony A. Scarpino joined the Governor at White Plains High School last week where local elected officials, members of Moms Demand Action, school staff and students showed their support of the bill. This ERPO bill would build on New York's strongest in the nation gun laws and prior legislative efforts, and, if passed, would make New York the first in the United States to empower its teachers and school administrators to prevent school shootings by pursuing court intervention.